Limited to the Chinese market, the Xiaomi Mi 5X smartphone is on the side of the devices made by the company where high-end phones lie. And, unexpectedly, this machine is not in the high-end price charging, as a matter of fact it is at the same level of the more economical sibling products the Redmi line. Although, it is spread the fact that this phone works on MIUI 9 OS (even though most of them come with the 8.5 version), this is still on the beta phase and it is limited to the Asian country stores. As a matter of fact, the product is not found in the foreign market with this denomination, the corporation launches it abroad with the name of Mi A1 – identical in function but differs in operative system working with Android Vanilla instead. 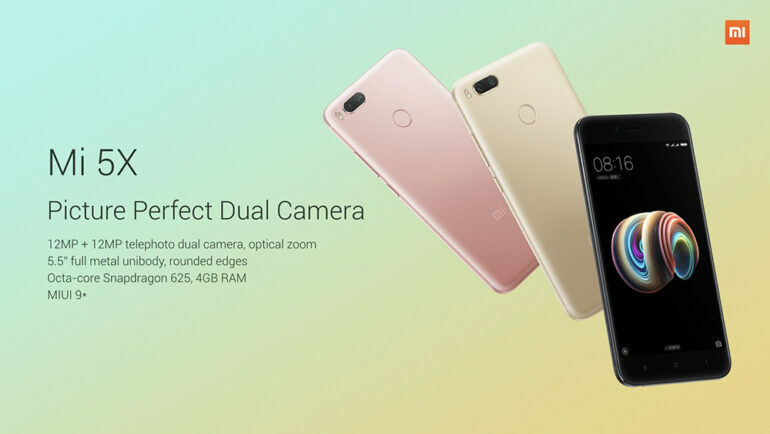 The product is featured with 5.5 inches IPS LCD display, a common trace in all the Xiaomi smartphones, with a 1080×1920 pixels resolution and a density of 402dpi. It allows sunlight visibility quite well, but a diminishing display of colors could be found while walking in broad daylight. Provided with a 3080 mAh battery is not great news, but the Snapdragon 625 chipset provides enough energy to a good battery performance. Thanks to the powerful chip, the phone proves to be successful in most of the usage scenarios, showing good results in video, call, web browsing and even in standby mode. In the connectivity department, the device provides Bluetooth 4.2, Wi-fi ac, GPS, GLONASS and Beidou. There is IR blaster at the top of the device; it comes in handy when operating any home appliance. The company provides its own app for remote controlling and a long list of devices supported by that application. An FM radio and recording are also provided with the product. Following the tradition of dual cameras, the Mi 5X smart phone provides with a primary camera in this category at 12MP with a flash on the left and features such as HDR, Portrait mode and 2X telephoto. Photos taken in good light conditions are high even when HDR is not used. Even at low light settings, pictures are clear, although zooming at this condition is not advisable. The camera also offers the panorama feature for taking landscapes worth to be remembered. The front camera comes at 5MP provides with average quality photos with little noise and low in details, but with nice colors and high contrast. It also gives the chance to record videos at 2160p at 30fps, with 4K option included. The quality of videos is great with plenty of details and good colors and contrast. But audio quality in video recording is not in the same level, it is low quality especially with loud sounds at the background. The device is intended to be a good photographic tool and the company has achieved its goal in this area. So the product should be acquired with that feature in mind. Finally, it is a good mid-range smartphone with certain limitations overcome by its accessibility in terms of pricing.